While the traditional method of cleaning up leaves with a rake and gloves gets the work done, you might enjoy using leaf scoops to make the job go faster. Often, the most awkward part of dealing with leaves is collecting them to put in a yard waste bag. These handy scoops will help you dispose of fallen foliage more efficiently. As an extension of your hands, leaf scoops enable you to gather up large amounts of leaves, twigs, and pine needles. Some types of scoops will protect your skin even if you aren’t wearing gloves. For example, the brand I chose for my home allows me to work glove-free. That’s very convenient when I want to fill my compost tumbler with mulch or avoid touching poison sumac. Let me tell you more about the ones I chose for my home below. ReLeaf describes their tool as “oversize leaf claws.” That’s an apt description for these plastic clamshells. To wear them, just slip your hands under the brace on the back and grasp the grip. On the front side, the shell covers the palm of your hands. I appreciate this design every time I need to pick up prickly weeds because it protects my hands. And do keep in mind that your wrist will be exposed, but if you use caution, it shouldn’t be a problem. Not only do the ReLeaf scoops help me clean up a pile of leaves quickly, they serve as a miniature bucket when I need to transport food waste to the compost, or even clean up after the dog. After a quick squirt with the garden hose, they are clean and ready for action again. There are other features of the ReLeaf claws that I find useful. One is that they have a hole for hanging on a hook or nail, and they stack together. These attributes make them simple to store out of the way. Depending on your needs, you may like one of these other two tools below better than the ReLeaf brand. Each one has its advantages. Instead of a protective molded grip like the ReLeaf claws, the leaf scoops made by Tabor Tools have an open design. 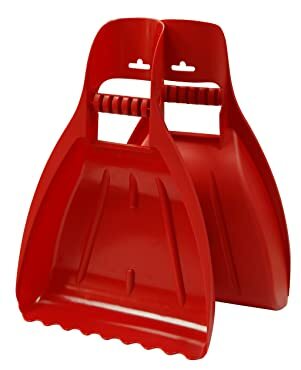 Depending on the mobility of your hands, you might prefer these scoops because they allow you to work by gripping the handlebar in a fist or even extending your fingers to brace the outside. Similar to the other leaf claws, these are lightweight and made of plastic. The plastic is UV-resistant, an important feature when you work a lot in the sunshine. Finally, they have a hole for hanging, and they nestle together for storage. As much as I liked the ReLeaf and the Tabor Tools scoops, I found another pair that might interest you below. 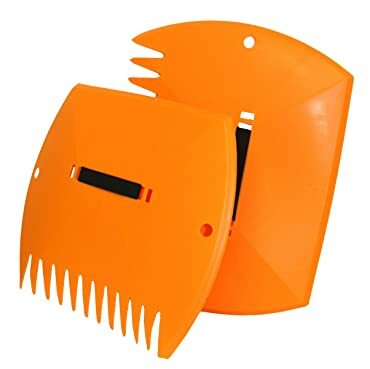 Midwest Gloves and Gear also sell plastic lawn claws, and theirs come in three colors. The edges of these tools have teeth, so you could use them for raking a small area. Their handles are elastic bands. Just slip your hand through the loops on the exterior of the scoops, and your hands are completely protected from the material you gather. So far, the only negative I’ve heard about this brand of leaf scoops is that the band tends to stretch out with use. But if you have trouble with flexibility in your hands, you may appreciate this style of the tool even more than the other models above. To wrap up, I’d like to tell you about the criteria I used to choose the best leaf claws for my yard. They may seem like a simple tool, but selecting the right kind of leaf scoop will make the difference as to whether you get the most out of them, or they end up gathering dust in the shed. Of course, you may also be interested in the color, or whether they resist ultraviolet light. I was most interested in whether the leaf scoops would be comfortable to use and if I could work with, or without gloves. Finally, since I am opposed to cluttering in my home, I preferred a style that would be easy to store. The ReLeaf Scoops meet all my requirements very well. As I’ve stepped up my yard care this year, I appreciate the convenience of using leaf scoops. The ones I choose make it straightforward to load debris into a yard waste bag, or even my compost bin. If you’re thinking about getting better tools for your garden, take a look at my other reviews to see what I discovered.